Discussion in 'UFOs, Aliens, Monsters, and the Paranormal' started by Mick West, Jun 13, 2015. 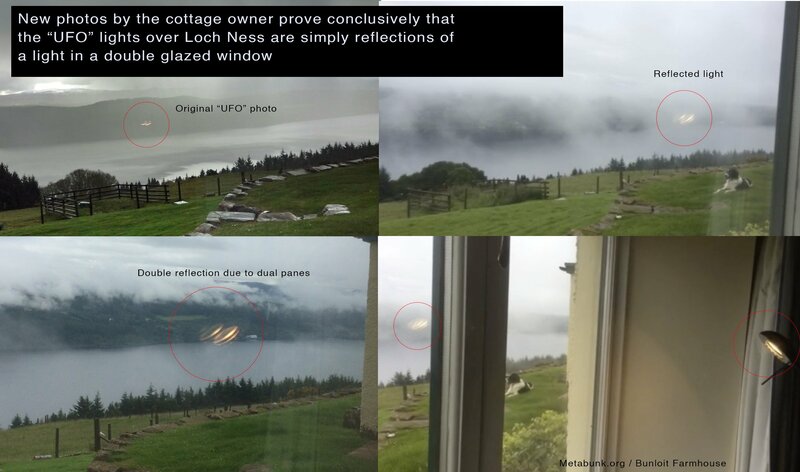 A recent photo proports to show a UFO over Loch Ness in Scotland, however it's almost certainly just the reflection of a light inside the room, doubled up by dual pane window. 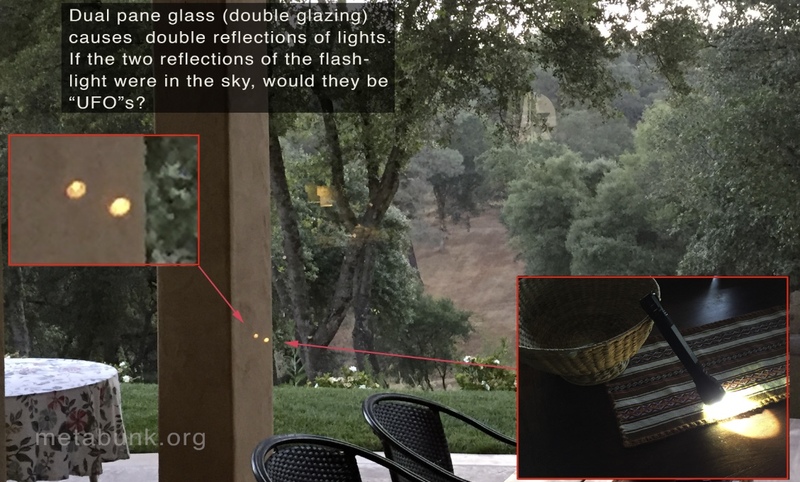 You can see the reflection of the curtain in the window, just like with the "UFO" photo, which demonstrates that the UFO photo was taken indoors. The light reflections here are a little bigger, as the light was moved closer to the window, but they are the exact same shape, color, and doubling as in the UFO photo, which proves conclusively that the "UFO" is simply the reflection of a light in the room. Many thanks to the owner of Bunloit Farmhouse for taking these photos and video! 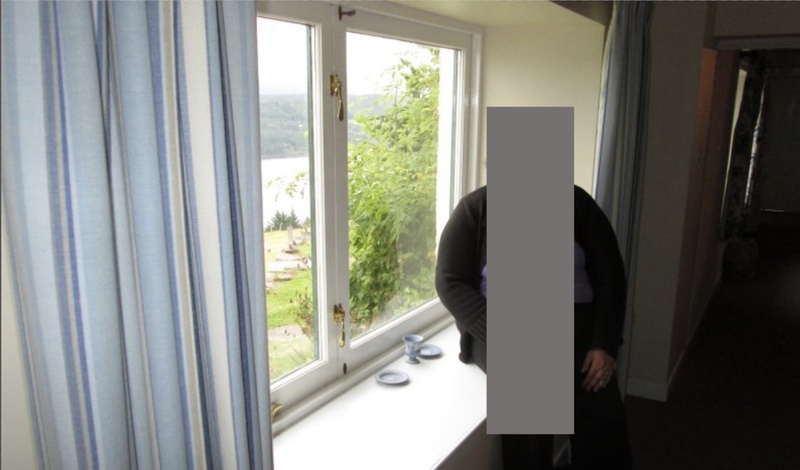 The story accompanying the photo described the photo as being taken "at a holiday cottage near Urquhart Castle". 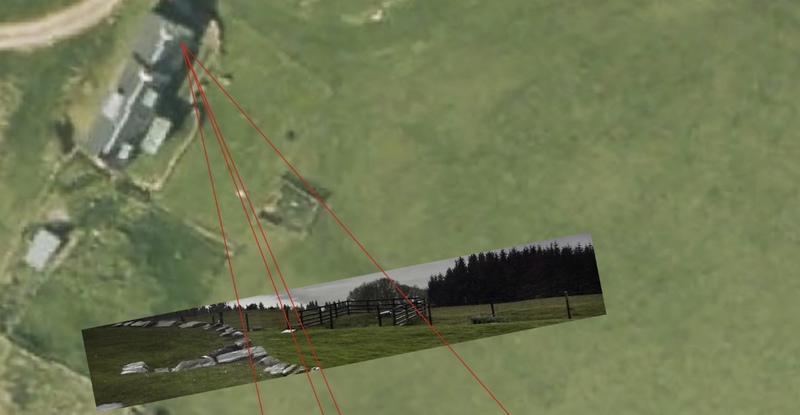 A brief examination of possible viewpoints in Google Earth let me to determine the viewpoint was near Bunloit. (notice the wall curves in where the steps are, so they are at 45° to the house. 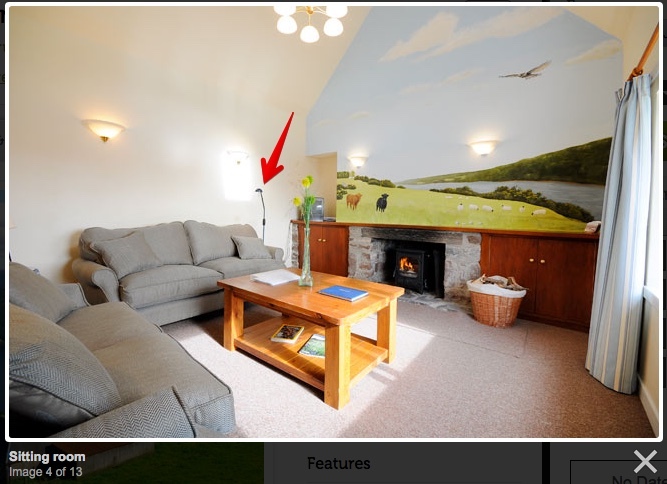 Which would put the camera in the sitting room, notice the reading lamp. 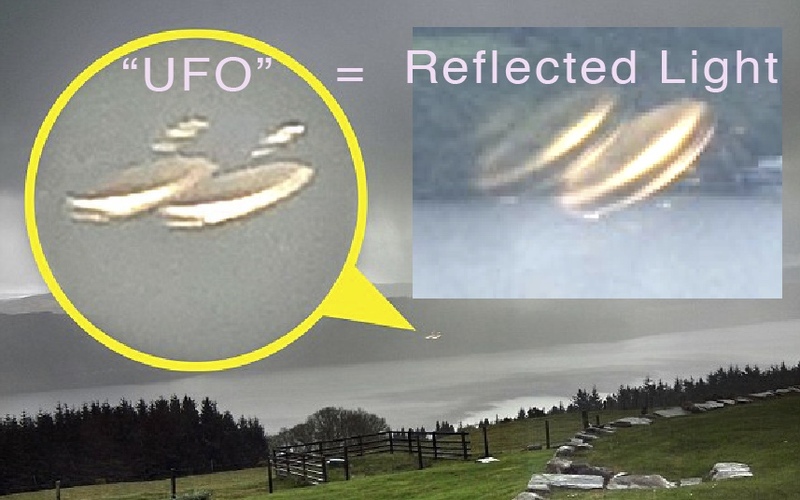 Also notice the blue and white striped curtains, which can be seen reflected in the "UFO" image on the right. The photographer claims the photo was taken from outside, but that is based on a recollection from a couple of days later, and the reflection of the curtain shows this to be impossible. No doubt they also took many photos outside, so the simplest explanation here is that they misremembered how this photo came to be taken. This photo from a previous visitor to the cottage shows the same view (notice the stone retaining wall and steps are lined up the same). The photographer would have been on the window seat, with the camera fairly close to the window, probably in the left window, and at about 45 degrees. But why two images? That's just what dual pane (double glazed) windows do, especially at an angle. 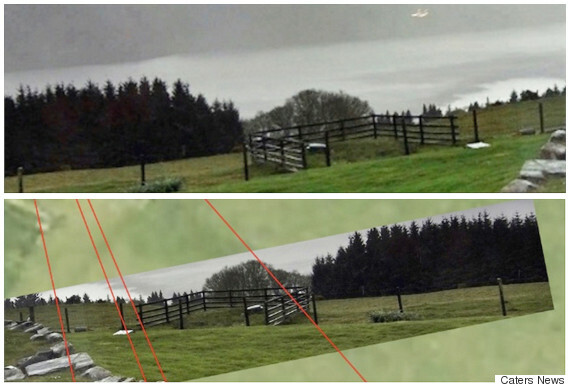 Using a flashlight, it's quite easy to get two images that are as well separated at these two. You might think that the fact that the two "UFOs" are lines up horizontally matches the reading light by the door, as it's at about normal camera level, which makes the reflections line up horizontally. But actually the orientation can vary quite a bit across the window, as the two panes are rarely parallel or perfectly flat. The best photo of the window looks like a dual pane (double glazed) window. 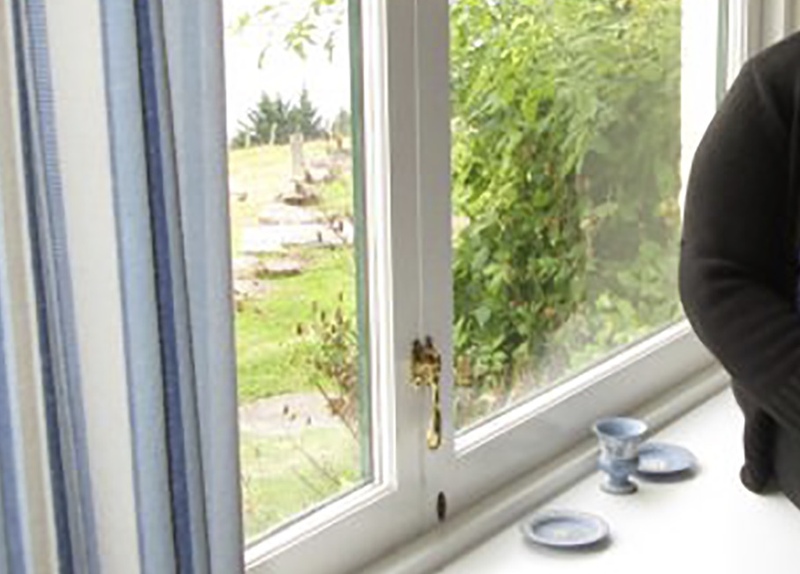 Update: The owner of the cottage confirmed via email that the windows are double glazed. I created a UFO window reflection some time back. The two faint white ellipses are reflections on a picture window of two overhead light fixtures. @deirdre I think I saw those on Ancient Aliens. They are good. 'We'd not seen it change that quickly before, which is why my mother-in-law went outside to take a general landscape picture. 'After the holiday we were looking through the pictures on our PC, as they were taken on a digital camera. perhaps some pictures were taken from outside but not the "UFO one" as examination of the evidence would suggest otherwise. And some supportive words of artifact refection in the DM articles comments as well. perhaps some pictures were taken from outside but not the "UFO one"
yea the reflection of the curtain pretty much debunks that claim right off. according to the Huffington Post, this is the "paper" (link below) the Betts contacted. The trip was April 29th so i think their memory is fuzzy regarding the details is all. in this pic i think i see a slightly heavy set person in a white shirt with sleeves just above the elbow (reflected in the window) in the tree line. There's a risk of pareidiola here, but there's only so many things it could be. Here I've flipped the image (so it as if you were looking in from outside) and boosted the colors and contrast. The most noticable thing is the two reddish shapes in the trees. I though they might be flowers on the table, but they seem too big for that, so the most likely thing to me seems that they are hands. There are hints of a person shape above and around the "hands" but it's hard to tell. The original photo would probably have enough info in it to distinguish what this was. found this shot too. although can only find in a small size. i think its a better view of where you would have to be standing. the stepping stones i believe curl to the doorway. 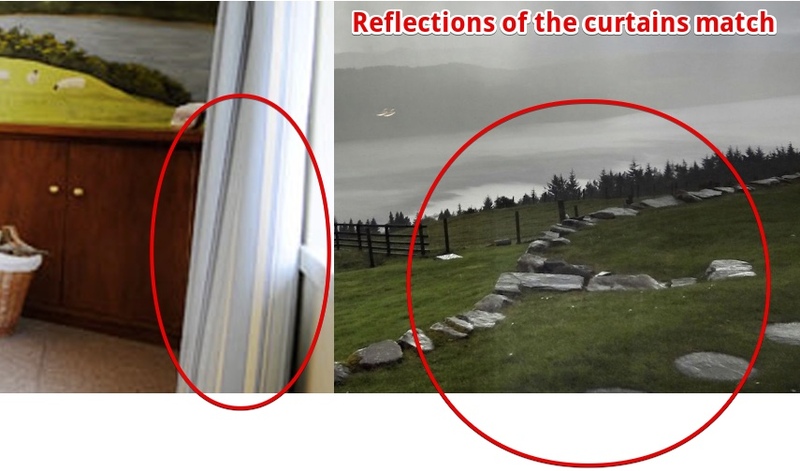 she would have had to be pressed up to the window in my opinion to get the stones in the shot, in your 3rd pic from top in OP you can see he is at almost the same angle and not even close to getting the stepping stones in the shot. No, the wall where the steps are angles in at about 45 degrees, so the view is looking nearly along the wall at that point. The viewpoint at the back window lines up perfectly with the front and back of the steps, and the extents of the three-sided fenced area. : ) thats the same thing i said. ps. stepping stones arent steps, they are the stepping stones .. the walkway. I thought you meant your small photo was taken from the same viewpoint. Apple maps has better imagery, which makes things clearer. I can't really tell where the stepping stones are. oh thats alot better. i couldnt even see the wood animal fence in google maps. Great stuff! This just shows if you take a look at what is being presented as proof continues to make the ET hoax even more hard to believe! This is really going to bum out Scott C. Warring at UFO Sightings Daily. He is convinced, and reminds all of his "followers" that this photo/story is direct proof that this is one of the 56 space faring species that we are all being kept in the dark from by the governments of the world? Strange but it seems like if there were that many different extraterrestrials it might be possible to keep that a secret? But, 56 different species, why not more than that? Seems like no government is able to keep any secret that involves more than a few people, yet its completely acceptable that all of the worlds governments are hiding 56 different ET, all who likely do not have the same agenda? "Seems like no government is able to keep any secret that involves more than a few people"
There are some awesome secrets, particularly involving certain areas of military technology, that are being kept pretty well under wraps. I have a couple of friends who are involved in government who have confirmed this to me, and on one occasion I was lucky enough to discuss "special forces" technology with a UK Navy bomb disposal diver, who assured me that some of the technology he has witnessed the special forces utilizing would absolutely blow your socks off. This included much better "invisibility" technology than we have been told is currently possible. I can certainly see why they would want to keep that out of the public eye. Political secrets coming out left right and centre is one thing. But military men in many cases have MUCH longer careers, and the controls in place to keep their secrets are much more stringent and well policed. Or, how could the worlds governments be making "deals" with ET species and not one single verifiable leak in over the last 60 years? "UFO" Picture I took through a window at work. What you are seeing are the overhead warehouse lights. famous genius Mick West, before he was a celebrity! All kidding aside, Mick, that's great! There's really no limit to what you can make people believe even with a couple of (accidently) well-staged photos, or statements using facts that are deliberately contorted or taken out of context, is there ? (shambles off for a long, sad walk contemplating the human condition). Based on the headline, maybe you should rename the site Metadeepen? A pretty dismissive follow up story. 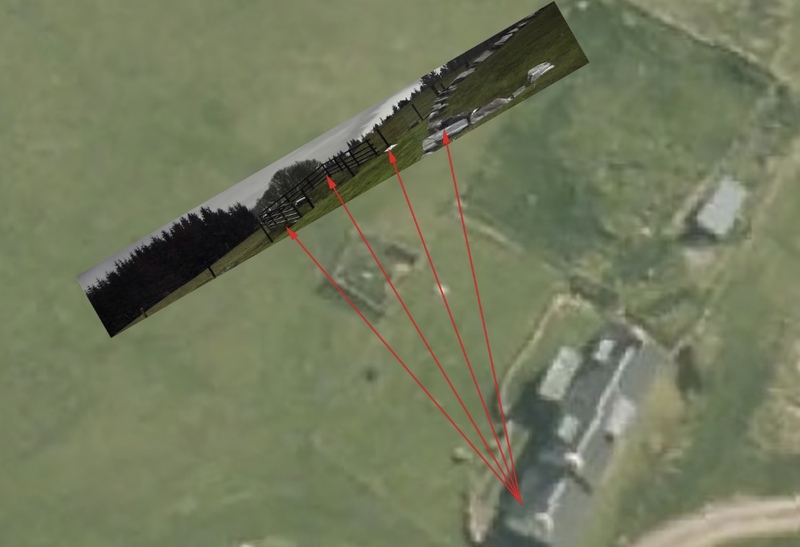 "Mick did some great investigative work with minimal resources, so rather than address the conclusions we'll use fuzzy eyewitness testimony, incredulity, and question why he hasn't made it to that exact house in Scotland in the past two weeks to prove his claim." Unfortunate that he chose to write about an irrelevant detail - the flipped image, as that's been used to cast doubt on the debunking, like I made some kind of major mistake. Really it made zero difference to the analysts. The Huffington Post also determined that one of the the photos posted on West’s site was actually reversed. 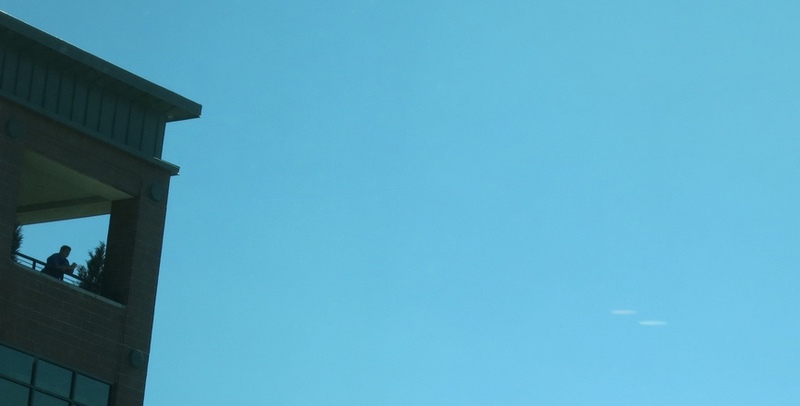 After they reached out to him, West noted that he had flipped the UFO image vertically as a matter of convenience, and that it did not affect his conclusions. 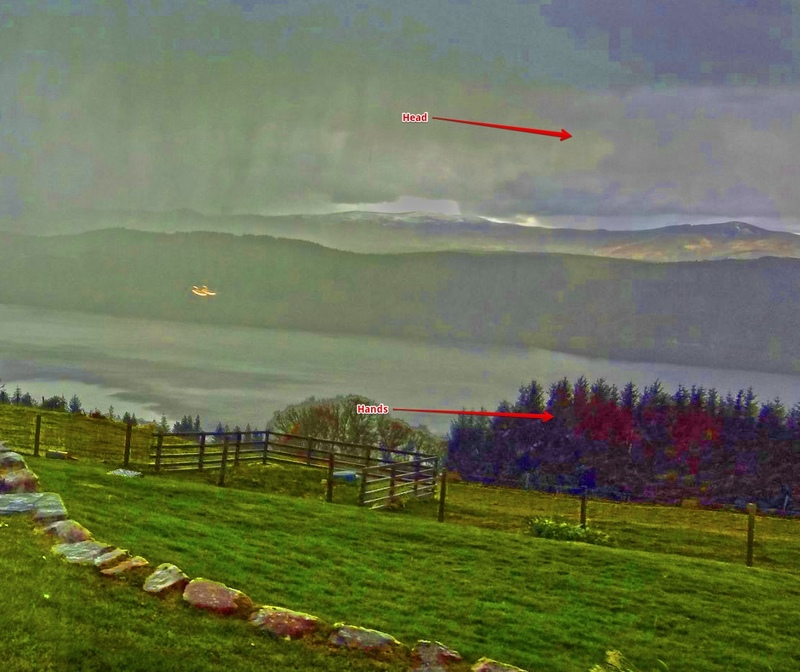 He has since updated his site to reflect the correct orientation of the Loch Ness UFO photo. A true believer might take this focus on an irrelevant detail as a reason to doubt the explanation. It's a good lesson - explain everything (or avoid things that require too much though) - as people latch onto even the slightest confusion as an excuse to reject an explanation they don't like. it sounds like they cant see the window reflections (the curtain and whatever shows up on the trees) in the photo. If they could make public ALL the outdoor shots, maybe in the process, that would help them see the difference between the outdoor shots (they probably DID take a few shots from outdoors) and the indoor shot(s). you still didnt explain it! Google maps is oriented looking North. so, you have to flip either the photo or your shot of Google maps. No, I took the second route, and replaced it with one rotated 180 degrees, so I didn't have to flip the image, and no explanation was needed. This is one of those cases where we know the location and we know pretty well for certain that the location is still as it was when the photo was taken. So all it needs is an enterprising journalist to go and replicate the photo. i'm talking about explaining the photo in the Huff article.. the original way you had it. I explained it, just not that clearly, as I don't think he was going to print it, as it was not something that really needed explanation, and I was removing it. Much ado about nothing. Unfortunately, the article makes your revision seem like an admission of wrongdoing. you're right, but it really doesnt matter - as the real evidence is the reflections of other items (besides the lights) in the room that are obvious in the photo. I see no evidence the Betts are lying. so they didnt use a double exposure app (which wouldnt look like that anyway), plus it doesnt sound like they used a phone. it sounds like they used an actual camera... although i could be mistaken about that. If we were provided all the other photos, perhaps we could determine from cloud movement how close together all the photos were taken. Perhaps the women DID go outside and take pics, and 10, 15, 20, 30 minutes later one of the men picked up the camera and took a shot and just forgot. I dont remember the details of every photo i take on vacation. That's a damned shame, Mick. You did a great job, and this 4 minute treatment of it is just pure crap. Have you thought about asking the owner of the lodge to take inside and outside pics? I was actually gonna tell you that. its really pretty there, AND you could go check out the Nessie museum. Its really a really cheap rental though if any of our England members want to go take the pic. The saddest part is how he kept saying "he went through alot of trouble"... no wonder the world doesnt bother looking things up if they think this particular thing is "alot of trouble". It's also a little amusing that the amount of work I put into a debunking is often used as evidence that I'm a paid shill (and there's even hints of that here), yet the fact that I didn't go to vastly more trouble and expense to take a 20 hour journey to Scotland is also hinted at as a problem with the debunk.